Parvo, or canine parvovirus (CPV) infection is a relatively new disease that appeared for the first time in dogs in 1978. Because of the severity of the disease and its rapid spread through the canine population, CPV has aroused a great deal of public interest. The virus that causes this disease is very similar to feline panleukopenia (feline distemper) and the two diseases are almost identical. It has been speculated that the canine virus is a mutation of the feline virus. However, that has never been scientifically proven. Two slightly different strains of canine parvovirus, named CPV-2a (1980) and CPV-2b (1984), are recognized. They cause the same disease and vaccines give protection against both. CPV-2b is associated with the most severe disease. A distinct type of parvovirus (CPV-1) has been found in pups with diarrhea and in normal dogs. CPV-1 is not believed to be an important cause of disease. The main source of the virus is from the feces of infected dogs. The virus begins to be shed in the feces just before clinical signs develop and shedding continues for about ten days. Susceptible dogs become infected by ingesting the virus. After ingestion, the virus is carried to the intestine where it invades the intestinal wall and causes inflammation. "CPV is very stable in the environment and is resistant to the effects of heat, detergents, alcohol, and many disinfectants." Unlike most other viruses, CPV is very stable in the environment and is resistant to the effects of heat, detergents, alcohol, and many disinfectants. A 1:30 bleach solution will destroy the infective virus. Infective CPV has been recovered from surfaces contaminated with dog feces even after three months at room temperature. Due to its environmental stability, the virus is easily transmitted via the hair or feet of infected dogs, or on shoes, clothes, and other objects contaminated by infected feces. Direct contact between dogs is not required to spread the virus. Dogs that become infected with the virus and show clinical signs will usually become ill within six to ten days after exposure. The clinical signs and symptoms of CPV disease can vary, but generally they include severe vomiting and diarrhea. The diarrhea often has a very strong smell, may contain lots of mucus and may or may not contain blood. Additionally, affected dogs often exhibit a lack of appetite, marked listlessness and depression, and fever. It is important to note that many dogs may not show every clinical sign, but vomiting and diarrhea are the most common and consistent signs; vomiting usually begins first. Parvo may affect dogs of all ages, but is most common in unvaccinated dogs less than one year of age. Young puppies less than five months of age are usually the most severely affected, and the most difficult to treat. Any unvaccinated puppy that shows the symptoms of vomiting or diarrhea should be tested for CPV. The clinical signs of CPV infection can mimic many other diseases that cause vomiting and diarrhea; consequently, the diagnosis of CPV is often a challenge for the veterinarian. The positive confirmation of CPV infection requires the demonstration of the virus or virus antigen in the stool, or the detection of anti-CPV antibodies in the blood serum. "There is a simple in-clinic test for CPV that will screen for this disease." There is a simple in-clinic test for CPV that will screen for this disease. Occasionally, a dog will have parvovirus but test negative for virus in the stool. Fortunately, this is an uncommon occurrence. A tentative diagnosis is often based on the presence of a reduced white blood cell count (leukopenia) and clinical signs. If further confirmation is needed, stool or blood can be submitted to a veterinary laboratory for additional tests. The absence of leukopenia does not mean that the dog does not have CPV infection. Some dogs that become clinically ill may not have a low white blood cell count. There is no treatment to kill the virus once it infects the dog. "The virus does not directly cause death; rather, it causes loss of the lining of the intestinal tract, and destroys some blood cell elements." However, the virus does not directly cause death; rather, it causes loss of the lining of the intestinal tract, and destroys some blood cell elements. The intestinal damage results in severe dehydration (water loss), electrolyte (sodium and potassium) imbalances, and infection in the bloodstream (septicemia). In this case, septicemia occurs when the bacteria that normally live in the intestinal tract are able to get into the blood stream; if septicemia develops, the dog is more likely to die. "Most dogs with CPV infection recover if aggressive treatment is used..."
Most dogs with CPV infection recover if aggressive treatment is used and if therapy is begun before severe septicemia and dehydration occur. For reasons not fully understood, some breeds, notably the Rottweiler, Doberman pinscher and English springer spaniel, have a much higher fatality rate than other breeds. In most cases, puppies that have not improved by the third or fourth day of treatment have a poor prognosis. 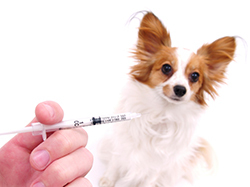 The best method of protecting your dog against CPV infection is proper vaccination. 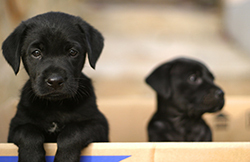 Puppies receive a parvovirus vaccination as part of their multiple-agent vaccine series. It is recommended to be given at 8, 12, and 16 weeks of age. In some high-risk situations, veterinarians will give the vaccine at two-week intervals, with an additional booster administered at 18 to 22 weeks of age. After the initial series of vaccinations, boosters will be required on a regular basis. If an approved three-year parvovirus vaccine was used, the next booster vaccine will be routinely administered in three years. Dogs in high exposure situations (i.e., kennels, dog shows, field trials, etc.) may be better protected with a booster every year. Pregnant females might be boostered with a killed parvovirus vaccine two to four weeks before whelping in order to transfer higher levels of protective antibodies to the puppies. Your veterinarian and you should make the final decision about the vaccination schedule that best fits your pet's lifestyle. The stability of the CPV in the environment makes it important to properly disinfect contaminated areas. "A solution of 1/2 cup of chlorine bleach in one gallon of water (133 ml in 4 liters of water) will disinfect food and water bowls and other contaminated items." A solution of 1/2 cup of chlorine bleach in one gallon of water (133 ml in 4 liters of water) will disinfect food and water bowls and other contaminated items. It is important that chlorine bleach be used because most disinfectants, even those claiming to be effective against viruses, will not kill the canine parvovirus. Does parvovirus pose a health risk for me? How about my cats? Currently, there is no evidence to indicate that CPV is transmissible to cats or humans.